Sponges and corals are two entirely different organisms. Both of them are from two different animal phyla. Sponges belong to the Porifera phylum and corals belong to Cnidaria phylum. The body of sponges lack true tissues and have hard protrusions known as spicules. Minute pores can be found all over the body and these pores are lined with flagellated cells. These flagella help the organism to take in water and food particles through the pores. When the water circulates through the body, the tissues absorb the food particles and eject the excess water through the pores. The oxygen required for energy also is absorbed in through the pores of the body. Corals have differentiated levels of tissue and live in large colonies but look like single organisms. The body is a polyp and has several tentacles. The organism uses these tentacles to sting the prey or opponent. Corals are symbiotic in nature and depend on the symbiotic algae for their food. These algae in turn give the corals the color. 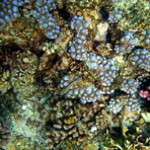 A colony of corals can be found in the shallow waters and require sunlight. Both sponges and corals live underwater and feed on underwater food particles. These organisms live in large colonies and exist in variety of colors. The organisms are multi-cellular and have different life cycles. Though sponges can live very deep under water, corals cannot exist in deep waters. Sponges feed on food from the water which is mostly microscopic organisms. The inhalant and exhalant pores for the intake and outflow of the water are different. Sponges have a unique feature ‘“ the functions of the cells can change when required. This capability is known as Totipotency. Adult sponges cannot move and get attached to the seabed but the larvae are mobile. Sponges have a defense mechanism. They produce toxins to protectÂ themselves from predators. Studies have revealed the presence of cyanobacteria inside and on the outside of the sponge cells. Some common sponges are the Gunpowder sponges and Red Beard sponge. A coral reef is comprised mainly of calcium carbonate. Mostly the underlying sections of the reef would be dead coral skeletons. The body of a coral has radial symmetry and has no internal organs. The tentacles on the body have stinging cells known as nematocysts. Different types of corals exist in the sea. Some of the common ones are sea pens, blue corals, sea fans, staghorn corals, clubbed finger corals, and soft corals. Certain corals depend on the algae for food while others feed on the plankton from the seawater. Coral reefs are widely used in the manufacture and development of drugs and for other industrial purposes. The Great Barrier Reef off the coast of Queensland, Australia is made up of corals and is one of the famous objects of study now. Manisha Kumar. "Difference Between Sponges and Corals." DifferenceBetween.net. August 24, 2009 < http://www.differencebetween.net/science/nature/difference-between-sponges-and-corals/ >.